The staff was the best I’ve ever had the pleasure of staying with. I recommend staying here every chance you get. The hosts were very wonderful and went over and above what was required. The hotel and beach was beautiful and clean. My wife and I had a fantastic time and would definitely Come back! I recommend this hotel, the owners are truly great and lovely people. Frau Anastasia is just amazing woman. We felt like being at home. Receptionist Maria helped us in all our needs, she's very kind and lovely person. Hotel is located on the clean free sandy beach. There are enough free sunbeds for all guests. The garden is full of aromas of tropical flowers. Cleaning at the hotel is high quality, thanks to Alkheta for the towel-artwork. Our kids really liked the figures made out of the towels. I recommend this hotel for everyone! Our apartment fronted on to the beach with a balcony on which to sit and enjoy the view. Hearing the sea at night from the bedroom at the back was an added bonus. The facilities were excellent with beach towels and a washing machine available if required. The owners and staff could not have been nicer so thank you Mary and thanks also to your mother and father and our friendly efficient cleaner. All in all, just perfect. Simple, comfortable hotel room with a beautiful view of the ocean and beach. Very nice place, right on the beach. Owners very friendly, even invited us for Easter Sunday lunch with the family. Thank you. Excellent Hotel on the Beach Lovely and welcoming staff Rooms were clean with gorgeous views of the beach! The owners were amazing and are running a very good family hotel ensuring the best quality for all of its guests. Right on the beach. Handy to resarants and shops. Off street parking. Beautiful setting and big. Very clean. Lock in a great price for Kristall Suites – rated 9.5 by recent guests! Kristall Suites This rating is a reflection of how the property compares to the industry standard when it comes to price, facilities and services available. It's based on a self-evaluation by the property. Use this rating to help choose your stay! One of our best sellers in Stalos! 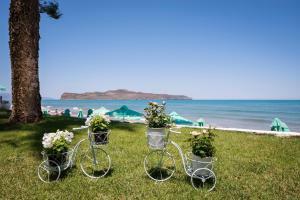 Enjoying a seafront location at Stalos Beach, Kristall Suites offer self-catering accommodations with Cretan Sea views. Free Wi-Fi is available in all areas. 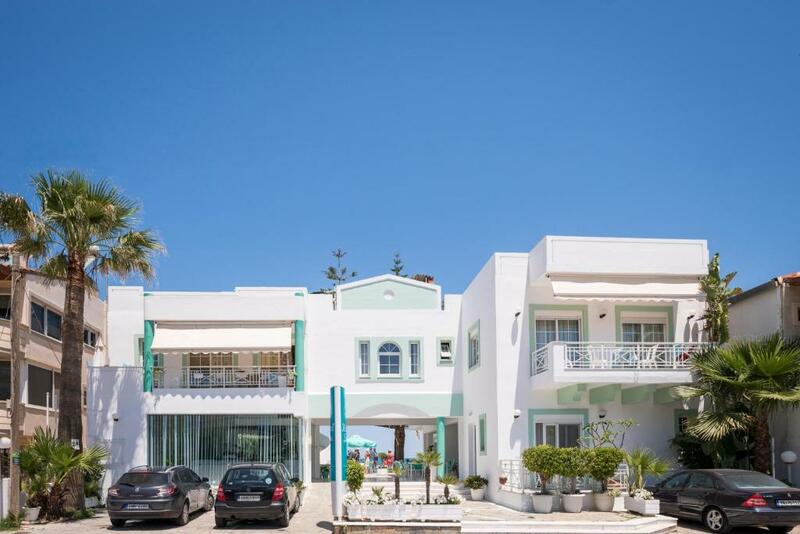 Facilities include a sun terrace and a well-tended garden with trees and flowers. All studios and apartments at Kristall are bright and open to a balcony. Each features a seating area with flat-screen TV and a kitchenette with cooking hobs and microwave. Some come with a separate bedroom. A communal shower room and 4 WCs are available for guests who have checked out. Several taverns and a mini market can be found within a 3-minute walk. The city of Chania with the scenic old port is 5 mi away. Chania International Airport is at a distance of 12 mi. Free private parking is possible on site. When would you like to stay at Kristall Suites? 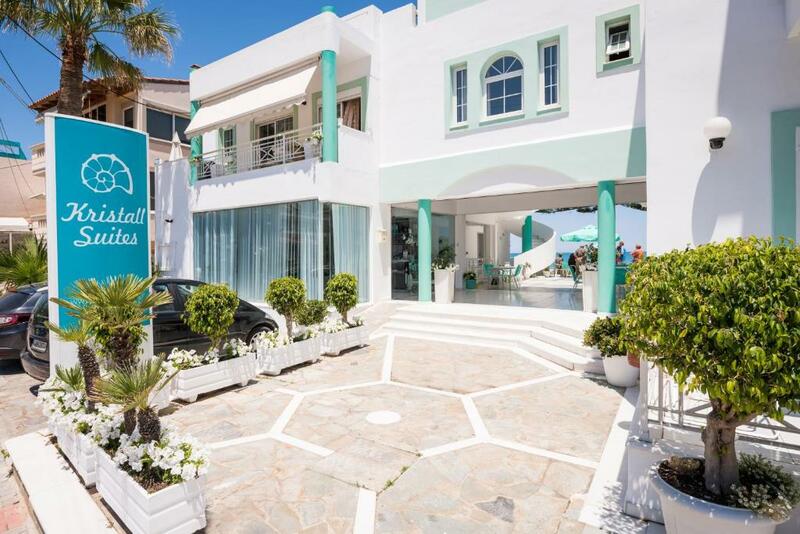 Featuring Cretan Sea and garden views, this air-conditioned studio opens to a balcony. It features a seating area with flat-screen TV and a kitchenette with cooking hobs and microwave. Free Wi-Fi is available. Featuring a balcony with Cretan Sea and garden views, this air-conditioned apartment has a separate bedroom. It features a seating area with flat-screen TV and a kitchenette with cooking hobs and microwave. Free Wi-Fi is available. Please note that 1 single bed turns into a double. This air-conditioned studio opens to a balcony. It features a seating area with flat-screen TV and a kitchenette with cooking hobs and microwave. Free Wi-Fi is available. Please note that this room type has views over the street. Opening to a balcony, this air-conditioned apartment has a separate bedroom. It features a seating area with flat-screen TV and a kitchenette with cooking hobs and microwave. Free Wi-Fi is available. 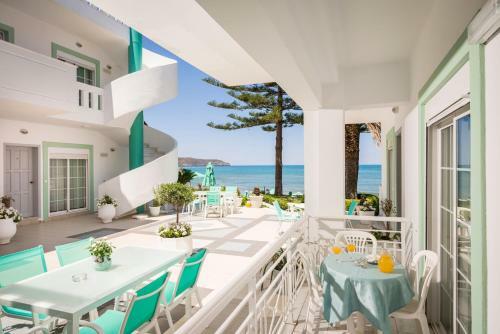 Το ξενοδοχείο “KRISTALL SUITES” πήρε το όνομα του από τα «κρυστάλλινα» νερά, αφού είναι χτισμένο κυριολεκτικά πάνω στην πεντακάθαρη και ήσυχη παραλία του Κάτω Σταλού των Χανίων της Κρήτης.Το ήσυχο περιβάλλον δίνει πραγματικά σε όλους τη δυνατότητα για χαλάρωση και ξεκούραση. Το ξενοδοχείο μας χαρακτηρίζεται για τη ζεστή και φιλική ατμόσφαιρα που προσφέρει.Η οικογένεια μας με την παραδοσιακή φιλοξενία, έχει ως στόχο να κάνει την διαμονή σας ευχάριστη, προσφέροντάς σας αξέχαστες διακοπές. Η οικογένεια μας με την παραδοσιακή φιλοξενία, έχει ως στόχο να κάνει την διαμονή σας ευχάριστη, προσφέροντάς σας αξέχαστες διακοπές. Ο Σταλός βρίσκεται 7 χλμ δυτικά των Χανίων, ανάμεσα στο Καλαμάκι και στην Αγία Μαρίνα. Όπως όλη η ευρύτερη περιοχή, ο Σταλός είναι τουριστικά ανεπτυγμένος και προσελκύει μεγάλους αριθμούς επισκεπτών κάθε καλοκαίρι. Ο Κάτω Σταλός, ο οποίος είναι το παραθαλάσσιο τμήμα της περιοχής έχει μια φανταστική παραλία με άμμο. Η παραλία είναι πολύ καλά οργανωμένη και σε αυτή παρέχονται όλες οι δυνατές τουριστικές υπηρεσίες. Γι’ αυτό το λόγο, η παραλία βραβεύεται κάθε χρόνο με γαλάζια σημαία. Ο Πάνω Σταλός, που βρίσκεται νοτιότερα προς την ενδοχώρα, είναι ένα πανέμορφο γραφικό χωριό, ανάμεσα σε καταπράσινους λόφους. Χαρακτηριστικό της περιοχής είναι οι πανέμορφοι ανάγλυφοι σχηματισμοί από βράχους. Προτιμάται ιδιαίτερα για διακοπές, καθώς είναι πολύ κοντά στην πόλη των Χανίων και προσφέρει όλες τις απαραίτητες υπηρεσίες στους επισκέπτες της περιοχής. Επίσης, υπάρχει τακτική αστική συγκοινωνία με το κέντρο της πόλης. House Rules Kristall Suites takes special requests – add in the next step! Kristall Suites accepts these cards and reserves the right to temporarily hold an amount prior to arrival. Kindly note that sun loungers and umbrellas are provided free of charge. Please note that towels are changed every 2 days. I enjoyed everything about Kristall Suites. Perfect all around. Noisy electric box in the room and room was never cleaned because the cleaner was ill? Its like a Familie, most guests a Comeback there year after year. 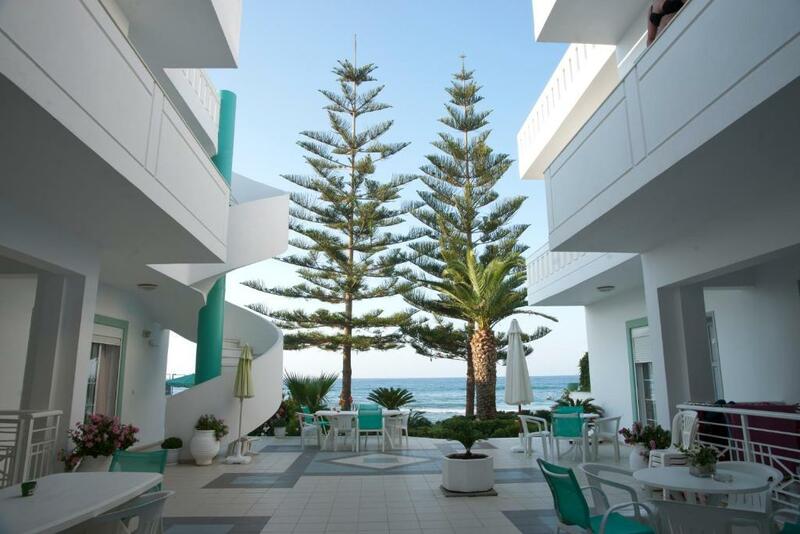 Road noise can be noticeable so ask for a room facing the patio or sea. Very warm welcome from Anna. Immaculate rooms and a lovely garden right on the beach at a reasonable price. 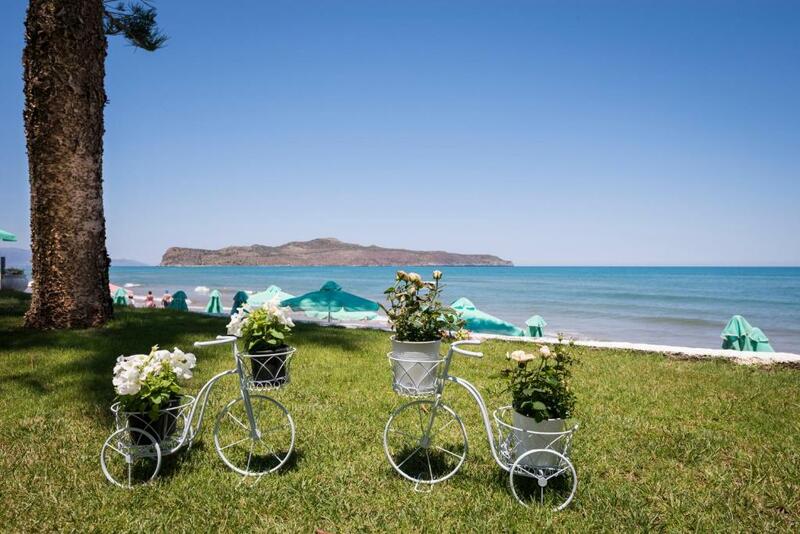 Fantastic location, right on the beach and we had a beautiful sea view. Aircon included in the price along with a good wifi connection. Supermarkets and restaurants were all within easy walking distance. All was wonderfull, these people are real grecks. 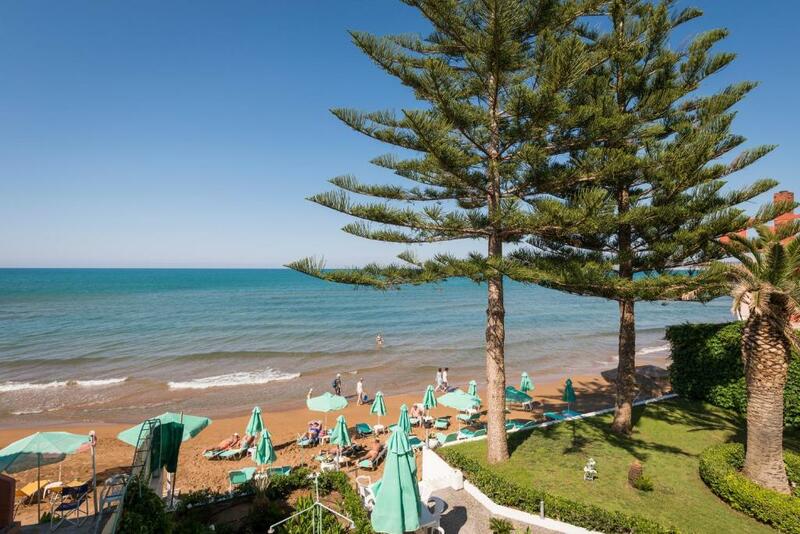 All propriety, with the beach and the sound of the sea is very special. Thanks and we will comming back 100%. Everything was perfect for this place.